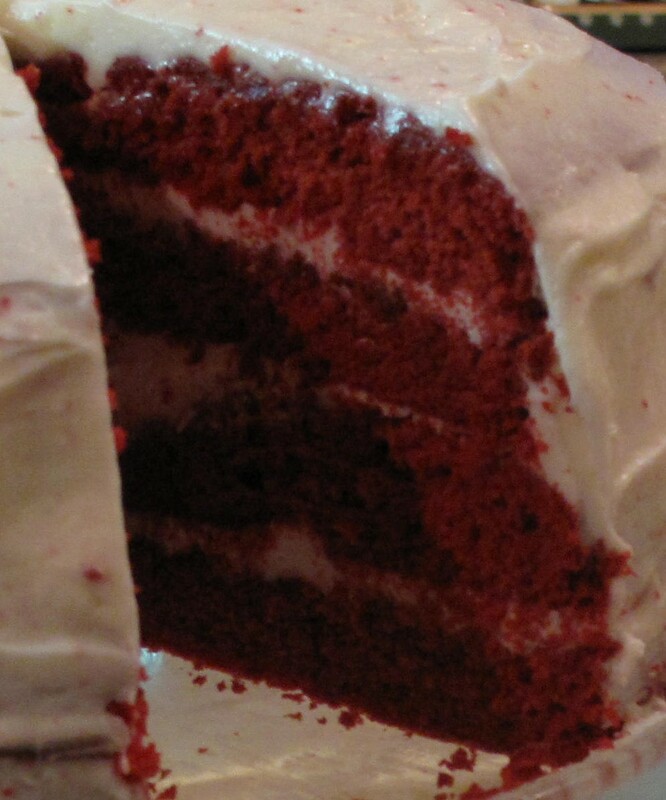 This is a slice of a wonderful red velvet cake. 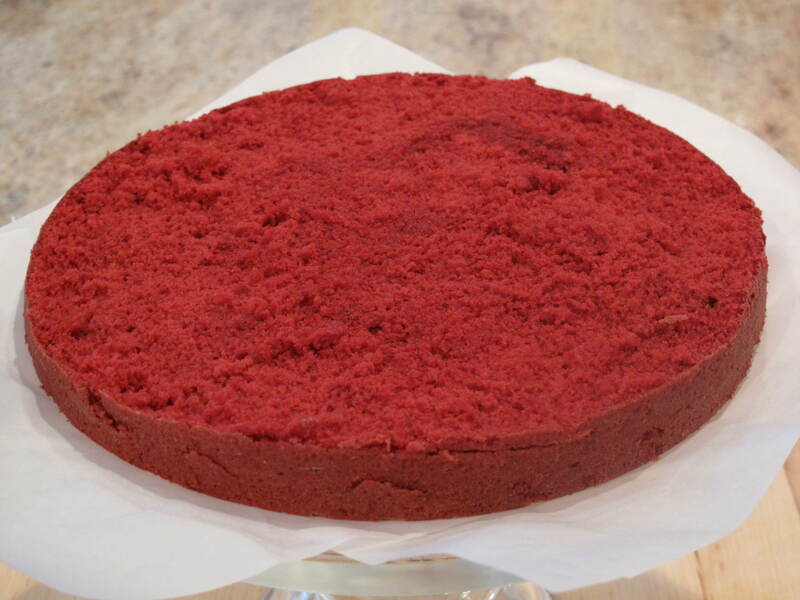 Red velvet cake is a mellow chocolate cake with an intense red color. A white cream cheese icing is traditional and, as you can see, my frosting ability is not too great. Even so, the cake and the frosting did not disappoint. 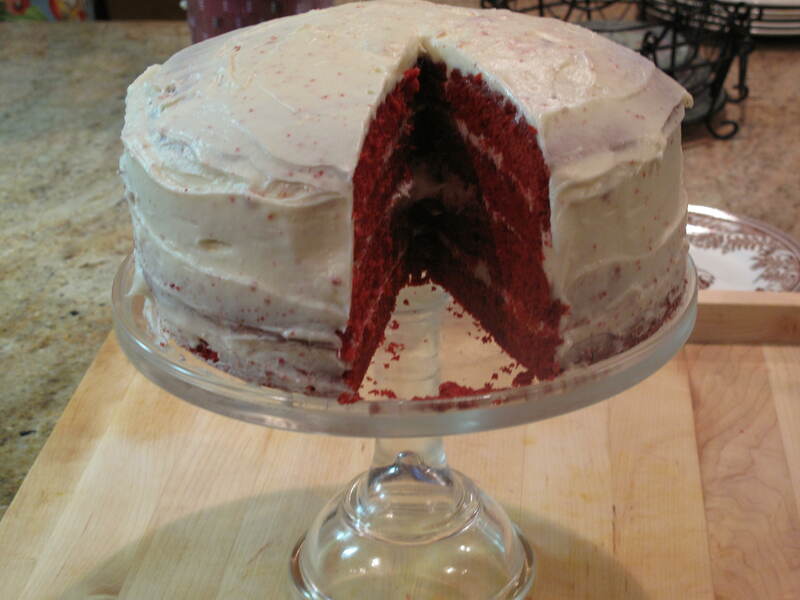 Most chefs say that it’s hard to get a good red velvet cake recipe. Many times they are bland without the proper amount of cocoa to give it the right chocolate taste. Many times they taste too citrusy due to way too much orange rind or flavoring being added. This recipe from the ‘Lee Bros. Southern Cookbook‘ is one of the best. I think it blends the cocoa and citrus to great effect. As you may recall, I am not a citrus or rind lover when I bake so I cut the recommended rind amount down to half of what was given. Why the red color? Obviously coloring the cake red does not give it any enhanced flavor. If the cake was just white or yellow, would people like it any less? I have to be honest and say that the answers to my questions were not easy to find on the internet or any of my cookbooks. 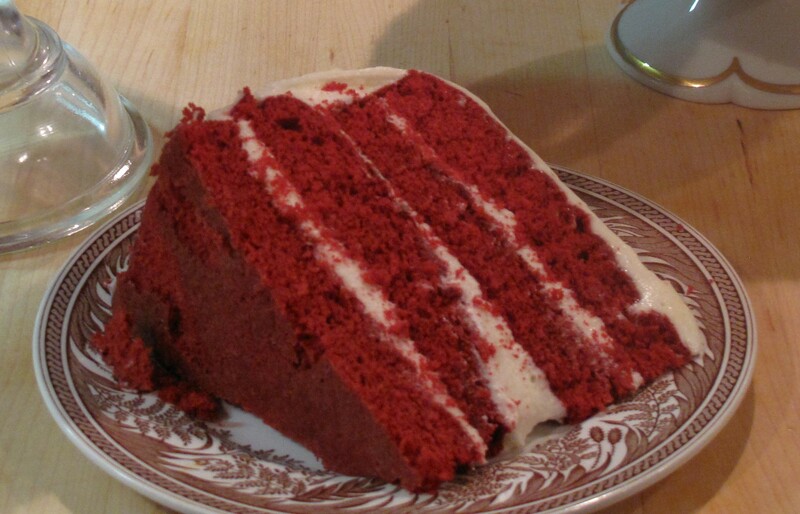 The best I could find was the red was probably added as a means to dress up a cake with no other flavor than some cocoa. I guess I’ll buy that, but I was looking for somewhat of a more elegant answer than this. Preheat the oven to 350 degrees. Grease and flour two 9-by-2-inch cake pans or line their bottoms with greased, floured waxed paper. Sift the flour, salt, baking powder and baking soda together twice. 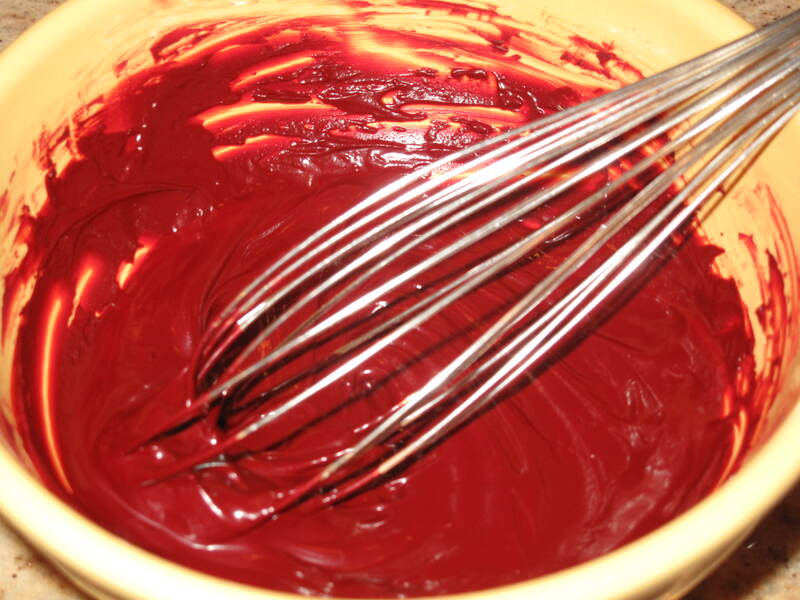 In a small mixing bowl, whisk the cocoa, red food coloring and water to a smooth paste, about 1 minute, and reserve. In a large mixing bowl, beat 1 cup butter with an electric mixer until creamy, about 30 seconds. Add the sugar, 1/4 cup at a time, beating about 15 seconds after each addition and scraping down the sides of the bowl if necessary, until the mixture has lightened in color and become fluffy, about 2 minutes. Add eggs, 1 at a time, the vanilla, and orange zest, beating for 15 seconds after each addition. Add the red cocoa paste and mix until evenly incorporated. Add the flour mixture to the butter and egg mixture in thirds, alternating with 2 additions of half the buttermilk. Once all ingredients are incorporated, beat the batter 10 to 12 strokes with your spoon or spatula if using cake flour, 2 to 3 strokes if using bleached all-purpose flour. 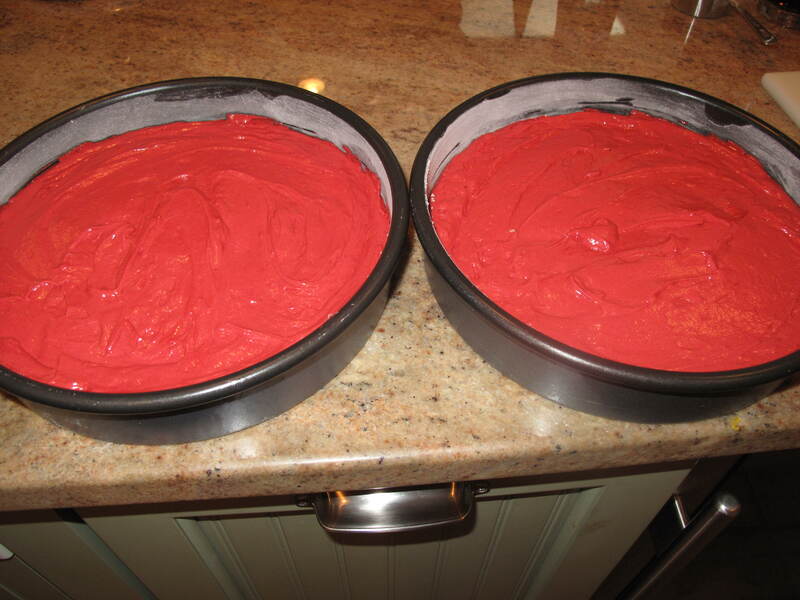 Divide the batter between the cake pans and spread the tops evenly with the wooden spoon or spatula. the pans and invert the cakes. Lift away the waxed paper, if using. Cool the cakes completely on a rack, with their tops facing up. In a large bowl, beat 3/4 cup butter with the mixer until creamy, about 30 seconds. Add the cream cheese and beat until the mixture is fluffy, white, and very smooth, about 1 minute. Add the confectioners’ sugar 1 cup at a time, beating for 30 seconds after each addition, until the mixture is creamy, fluffy, and smooth. If the frosting is too stiff, beat the milk into it to loosen it. Gently ice the cake layers generously. Spoon 1 cup of icing in the center of the first cake layer. Working an icing or rubber spatula in gentle swirling motions, spread the icing from the center toward the edges of the cake until it forms an even layer 1/3 to 1/2 inch thick (if you need to add more icing, add it to the center and work it out toward the sides). Carefully set the second cake layer on top of the first and ice the second layer in the same manner, beginning with a dollop in the center and working it out to the sides. Then ice the sides of the cake. For my cake, I cut each cake in half in order to have four layers. Store the cake at room temperature, beneath a cake cover. If you don’t plan to eat it for 24 hours, put it on a plate, tent it with plastic wrap and store it in the refrigerator for up to 3 days. Remember to remove the cake from the refrigerator 1 hour or more before serving to take the chill off. So I’ve determined that red tastes…delicious. Again, the recipe above has cut the citrus recommended in half. I could still taste a pretty good hint of citrus, so I might even go with less the next time around. As for my frosting abilities, I think I need to take a class or just use chocolate frosting (which hides all sins) for the rest of my life. Chocolate frosting forever…thinking about it, what could be bad with that? What is your favorite kind of cake/frosting? This entry was posted in Food and tagged Acorns, Baking, Beauty, Blog, Cooking, Dessert, Entertainment, Family, Food, Fun, Life, Lifestyle, Love, My Life, Photos, Recipes, Summer, Thoughts. Bookmark the permalink. Katherine makes this white cake with a bourbon, coconut, pecan icing. We got it from Bon Appetit years ago. That’s one of my favorites. This is a great recipe. The cakes turned out wonderfully. Hi Greg. Sounds good to me, but there is no piece of cake that I’ve ever turned away. Take care. I lean toward chocolate but will try anything. Receipe looks a little difficult for me so guess I will still bake the boxed German Chocolate cake. It is very good. Hi Carolkin. German chocolate cake works for me too. Come back and visit soon. Cake looks lush, I am an ounces and grams lady. Wish I can convert it!